Lushnja district lies in the Western Lowland of Albania surrounded by Kavaja district in the north, , Fier in the Southwest and the Adriatic Sea in the west. The only relief are the Darsia hills, filled with olive groves and fruit trees. Lushnja is famous for its melon, a favorite fruit, of the summer. The district has two municipalities and 14 communes with 119 villages. The city is mentioned for the first time in the years 1430-1432, with the names "Lusna", "Lusnie" and was no more than a village with about 15 houses. History of ancient Illyrians ascribes this area, of which called "Field Gylakion", according to the prince Gylak. It was later called "Field of Iliriku" and after years 1480 was called Field of Saura. All areas of Myzeqe during the Middle Ages, belonged to the royal family of Muzakaj, from which is thought to have left the name Myzeqe. Th residents of Myzeqe call themselves Lale. Like all the cities of Albania the active part of the people of Lushnja has contributed in different periods of history remarkable for the country. A historical detail is remembered and recorded in the history of Albania, besides that of the city, is Lushnja Congress, held in 21-31 of January 1920 after the Paris Peace Conference, where the Albanian delegation was against the partition of Albania in 1913. One of the decisions that came out of this Congress, was the collapse of the current government of Durres and the declaration of Tirana as the capital of Albania. Lushnja has issued many prominent personalities in the field of art, who have surpassed the boundaries of Albania, the singer Vaçe Zela, the writer Vath Koreshi, actors Margarita Xhepa, Ilia Shyti, Pavlina Mani etc. Lushnja and all Myzeqe area is characterized by mild climate with long dry summers, and wet short winters. Advised mostly light cotton clothing in summer, especially in the coastal area, but should take precautions for the presence of large insects, in the large park of Divjaka, who is leading the tourist destination of Lushnja. Lushnja is a very active city with tradition in delivering the culture. It currently has a cultural center that hosts events of all genres, to keep alive active the artistic life of the city. The ethnographic wealth of the area consists of the spiritual and material. The latter is shown mostly through popular clothing. Once outfits wandered in handloom and every house had a kind, hers and dresses there from internal cash shirts for women and men, linen, silk curtains, thick clothing like vests, cloaks, socks, carpets, rug, bags etc.. Undoubtedly the most visited tourist spots of the city is Ardenica Monastery, about 10 km in the direction of the road Lushnje-Fier. 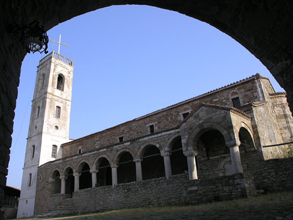 Closely linked with the history of Albania, because of Skanderbeg marriage with Donika, from the tribe of Aranits, the monastery is a religious act of the XV-XIX century. It served as religious cult, but is also used as educational center in the early twentieth century, and a special else that might be mentioned, is that there are played in most of the Albanian films of communist regime when the fable of film should include a religious theme. Near of the monastery is also a source of warm salt water, for which the locals say is holy place. Karbunara’s Castle, located on the hill of Karbunara village, surrounded by an area of 1.7 hectares. Thick stone walls served as protection from enemies in different periods. History says it was built in the century. IV-VI e.s. Darsia hills, the highest point of the city, located in eastern suburbs. There you will also find a very beautiful tourist complex, where city dwellers spend their free time in the open air, with the forest of Divjakeon the horizon. National Park " the Pine of Divjake"
Situated in the district of Lushnja, it lies in an area of 1250 hectares, 5 km away from Divjaka, on the shore of the Adriatic sea and 40 km from Lushnja. The Park is part of the Karavasta lagoo and declared protected area by International Ramsar Convention in 1994. With these characteristics, they definitely offer rare natural beauty that have developed in a modest way and all types of tourism, ecotourism, sport hunting, meditation etc. In Karavasta Lagoon grow the curly pelican, the only of its kind in Europe and accounts for about 6% of the fauna of the lagoon with 229 species of birds. Divjaka is the only place in Albania where grow a limited number of buffalos known for their rich milk fats and proteins. The park has typical Mediterranean climate with hot dry summer and warm rainy winter. Many birds which do not emigrate, have their home at the environments of the park. The vegetation is mostly coniferous with plants like wild pine-tree and a less quantity of cultivated variety. The special thing is its multilayered character of the plants, starting from herbaceous and going on with the high pine-trees with top like umbrellas. The Divjaka Park is one of the most important ecosystems in whole Albania, thanks to the rich fauna sustained by the numerous and diverse habitants within this ligatinous, coastal ensemble. These habitants are used as winter destinations for nesting or migration by many kind of birds. So fare are discovered that in this area grow and stay 229 kind of birds. A typical representative of the ecosystem is the curl pelican (pelicanus crispus), and about 6,4% of its entire population nests in the Lagoon. Karavastaja is the furthest western point of nesting of this sort of bird in Europe. Other species in danger of extinction have their location in this park too. The area of Divjaka is the only place in Albania where grows the wild cow. Nowadays the number of these animals is very small. because of the rich vegetation in every peace of the green floor of the forest. Different restaurants and hotels can offer the riding horse service, offering you a very big pleasure to ride through the deep forest. The Hotels in Lushnje are mainly provided by several small hotels, with comfortable conditions. So you can find refuge in El'Don Park, Blerimi, Pilo Lala etc. On the coast of Divjaka we will suggest, hotel Different, Laguna Park, Pine complex etc.. The cuisine is mainly based on fresh products and traditional dishes of the country, the village birds, fish and eels in the lagoon, sea, etc.. Raki from the vineyards of the area is very good and wine are served preferably also from the country. The island of Pelican, Karavasta Lagoon, about 0.5 m above sea level. The island is formed by accumulations of organic waste. There lives the curly pelican, the largest bird in Europe, and in risk for extinction. Divjaka National Park. The island of Kulari. 0.5 m above sea level. It is formed by accumulations of river wastes. Covered by shrubs, trees, wild poplar, ash, winter pasture. We meet aquatic birds, among them the curly pelican. Divjaka National Park. The littoral braid of the New Lagoon of Karavasta. In the west side of the old lagoon, 0.5 m above the sea level, formed by marine accumulations. Covered with grass and rare shrub vegetation. It is several km long, 30 m wide. Divjaka National Park. The dunes of Divjaka oasis. There are 4 dunes 600 m long and 1-3 m high. Divjaka National Park. Thermal waters of Karbunarë. 50 m above sea level. There are 4-5 sources of water, which contain sulphydric gas and forms two holes 3-5 m long, 2-3 m wide 0.30 to 40 cm deep. Lushnjë-Karbunarë itinerary. Godulla of pine. Forests of Divjaka, 50 m above sea level. Constitutes in lagoon 1.8 km long and 400 m wide, where ends the drainage channel of Tërbufit. Surrounded by pine forest and dunes with plenty of shrubs and pines. Divjaka National Park.